Please help me welcome Nalini toThat’s What I’m Talking About. Twimom: Nalini, welcome to That’s What I’m Talking About from all the review ladies. We are all very big fans! Nalini: Thanks for having me! Twimom: Congratulations on the upcoming release of Heart of Obsidian, the twelfth book in your amazing Psy/Changeling series. When you first started with Slave to Sensation, did you imagine you’d end up here? Have the pathways or storylines altered much along the journey from the beginning to this climatic book? Nalini: I knew where I wanted to go from the very start, which has helped me stay on track. While I’ve always had the end goal in mind, I’ve let the characters lead me there, so there have been plenty of surprises along the way. Nalini: As of now, a two chapter preview has been posted online, so the male lead of the book is known. As for the speculation about the book, what I find fascinating is that recently, a few people have guessed almost to the letter certain elements of the book. One particular comment—which a friend who’d read the book forwarded me, after seeing it online—hit it out of the ballpark. I was delighted by that comment, because it means I’ve done my job right, laid the foundation for certain conclusions to be drawn. There are, however, some things no one has guessed (at least not that I know of), but that once you read the book, will fit into the overall jigsaw of the series. I hope these elements don’t leak prior to the release date, as these are powerful moments within the story that I’d love readers to experience first hand, rather than be told about them. Twimom: I know I am super excited about reading Heart of Obsidian and I’ve done everything possible to stay away from spoilers! It’s been fun. Was the choice to base the Psy/Changeling series, as well as the Guild Hunter series, primarily in the United States a personal one or for wider reader appeal? Have you considered setting a series in your native Fiji or New Zealand? Nalini: I get asked this question a lot, and the simple answer is that both Fiji and New Zealand are just too small, geographically and population wise, for the kinds of stories I tell in my two series. I needed massive areas of land, huge political powers, and much as I love my homeland and my birthplace both, we’re minnows on the world stage. (Minnows with some breathtaking scenery and gorgeous water in the case of Fiji, but minnows regardless). Locations have to fit the stories, so I’m totally open to NZ as a location for the right story or stories (one of my other projects that you may see one day, does in fact use NZ as a setting). Several of my Silhouette Desires were also set in NZ, and I even sent a couple to honeymoon in Fiji. Twimom: One of the things I love about your storytelling is your attention to detail and ability to paint a visual image with your words. Have you visited and/or spent much time in Northern California, the Bay area, and/or Yosemite to help you with the setting details? How much does your worldly travel impact your fictional locales? And where did I end up for most of my time in the country but in California.  I fell in love with the region, and when the idea for Slave to Sensation hit me, the location came with it – California was absolutely perfect. It had everything I needed, cities, mountains, lakes, forests, even desert regions. The travel does definitely help me in terms of opening my mind to all the myriad locations out there. 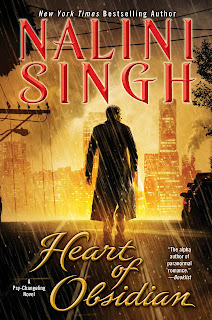 I was able to set Archangel’s Storm in India because I’d been there, specifically to the region where Neha’s court is based in the book, and because of that, I could insert tiny details that add to the authenticity of the story. Having said that, I do also use locations I haven’t visited – with the Internet, research material is at my fingertips. People take videos, cities have webcams, there are countless blogs and photos…as with the pages of a good book, good research can take you anywhere! Twimom: You are a very engaged author with your fans (for which we are grateful). How do you find a balance between writing a handful of quality books each year, your travels, keeping up with your fans, and life in general? Nalini: I’m not always balanced – I can disappear into my writing cave for months at a time if I’m not careful. So I’ve learned to consciously make time for friends and family, and to have days off in the weekends. The travel is a part of me, and the way I’m able to do it is that I’m super focused when I’m home, so I “save up” time to travel. I’ve also learned to write anywhere – planes, airports, trains, you name it, I’ve written there. (Even in a tent in a desert). With my everyday fan interaction, it truly doesn’t feel like work. I enjoy social media, so it’s fun to check in every morning or in the afternoon. I love the photos people post, the comments they leave, the interesting questions they ask. As a writer, I work alone the majority of the time, so it’s nice to have that interaction during my work day. However, writing is where my heart is, and I think fans, too, would rather I write than be online, so when I need to go under and focus exclusively on the book, I do, and readers have been really supportive of those time outs. Twimom: I always love to find out what my favorite authors are reading… What is your favorite book you read in the past year? What is your most anticipated read coming in 2013? Nalini: I have many favorites! One of my favorites of the last year was actually a non-fiction book. It’s called “Brain on Fire: My Month of Madness” by Susannah Cahalan – about a woman who thinks she’s going mad, but it turns out she has a rare brain disease. I found it a fascinating medical whodunit. As for anticipated reads in 2013 – I’m really lucky because after so many years in the industry, I’m either friends with many of my favorite authors, or I know people I can ask for early copies of books I can’t wait to read. This isn’t because I just like to have early copies, but because often, I know I’ll be on deadline when a book is due to be released, so if I can sneak it in early, I will! As a result, I’ve already read Guardian Demon by Meljean Brook, which is a book I’ve been waiting for, for years. Michael! He’s everything I dreamed he would be! Meljean really fulfilled her promise to fans with this book. I also have Magic Rises by Ilona Andrews and I’m so looking forward to it (also a little bit scared after the hints the authors have dropped, but I trust them *bites nails*). The next Sharon Lee and Steve Miller book is also a must-read. I adore the Liaden series, and every romance reader I’ve recommended it to has fallen for it as well, so you should all try it – especially since Agent of Change, one of the entry points in the series, is currently a free ebook (yes, I am a book pusher). I really liked Agent of Change, but I don’t think it’s the most romantic book in the series by far, so I’d suggest readers read the excerpts/blurbs of the other books as well. I love the interconnectivity of the series, and the fact that beneath it all, it’s a continuing story about a family. And I’m always, always looking forward to the next JD Robb. I love the In Death series to pieces. These are just a few of my anticipated reads. I have so many more! Twimom: Nalini, once again thank you so much for taking the time to tell my readers a little bit about yourself and your writing. It was wonderful chatting with you. Nalini: Thanks for the great interview. GIVEAWAY: I have one (1) copy of Nalini’s recent Psy/Changeling anthology title, Wild Invitation, to giveaway here at That’s What I’m Talking About. Thank you to Nalini for sponsoring the giveaway. To enter, please complete the Rafflecopter form, below, and leave a comment at the end of today’s interview as to which Psy/Changeling character is your favorite. (If you haven’t read the series, list any favorite character and include what book/author it comes from.) One entry per person. Winner will be selected randomly from eligible entries. CONTEST IS OPEN INTERNATIONALLY, and prize will be mailed by the author. Contest open from May 31, 2013 until June 8, 2013 at 12:00 AM EDT-midnight. I am not responsible for items lost in the mail. If you have problems with the Rafflecopter form, please email me at twimom227 at gmail dot com. I haven’t read the series yet they are in my tbr which I am slowly trying to get though, so many books so little time. One of my face characters is Eve Dallas and Roarke they just speak to me. Great to read these answers, thanks Twimom for asking good questions & Nalini for the answers! I think once the book comes out I’m going to go offline for a few days until I’ve finished reading it, to make sure I don’t accidentally stumble on any spoilers. Great interview! Can’t wait until Heart of Obsidian to be released 🙂 The Psy/Changeling series is one of my favourites so I love lots of the characters. Hawke, Drew, Riley, Mercy, Indigo. To name a few. But if I had to choose I’ll go with Judd 🙂 Thanks for the giveaway! Can’t wait fror this one! Several of the Psy-Changeling characters make my favorites list, but if I absolutely have to pick just one – it’s got to be Judd Lauren. There is not one single thing I don’t enjoy / admire about him. I haven’t read any of this series yet. One of my favorite characters is Faramir from the Lord of the Rings. BTW thanks for the awesome giveaway and for making it international! I’m fitting right in since I haven’t read it yet either. It sounds like a series I would enjoy. Thanks. I absolutely LOVE LOVE LOVE the Psy-Changeling series! My favorite character would have to be Lucas. Or Hawke. Thanks for the interview!! I have to say Kaleb is my favorite and I’m beyond excited for his book! It’s a tie for me between Hawke, Lucas and Riley! They are all fabulous! So excited to read Heart of Obsidian! Is it possible to say one favorite character? No, so I say that I love Riley to pieces Hawhe, Judd and of course Riaz!!!! Hawke!!!!!!! 😀 hehe I think Kaleb will come as a close second once I’ve read HoO. Great interview! I loooooooooooooooove Sienna.She’s just so strong!!!! I love Sienna too. She’s gone through so much, but come out on top. I haven’t read the series yet. My fav character of all the books I read – Harry Dresden from Jim Butcher’s series. Love the pop culture references. Psy-changeling is the best thing. Guild Hunter being a close second. I thought Judd was the best character, and Brenna suited him so well! Prior to Book #12…my favorite character is Judd Lauren. “Caressed by Ice” just completely blew me away when I first read it, and on subsequent re-reads it has lost almost none of its magic–which is a rare thing, imo. The melting of the ice-cold, dark assassin hero is a fabulous trope, and Ms. Singh really does it right.